How much does it cost to travel to Colombia? How much money will you need in Colombia? CO$92,668 ($30) is the average daily price for traveling in Colombia. The average price of food for one day is CO$23,774 ($7.63). The average price of a hotel for a couple is CO$76,336 ($25). Additional pricing is in the table below. These average travel prices have been collected from other travelers to help you plan your own travel budget. How much money do I need for Colombia? Colombia is in the northern part of South America and controls access between Central America and South America. 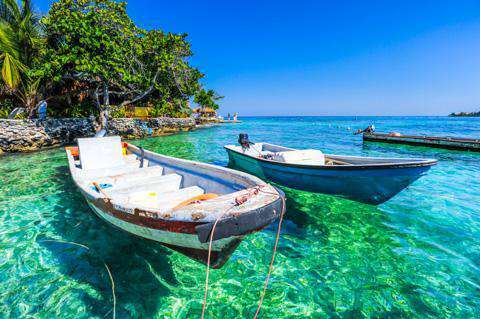 It also has a coastline along both the Caribbean Sea and the Pacific Ocean. Colombia is a very diverse destination with a range of landscapes, cultures, and attractions that appeal to travelers. Starting in Bogota you can have an experience rich in art, architecture, cuisine, and shopping. From there you can travel for one or two hours in almost any direction and you will find yourself in a unique landscape and climate. Head to the Colombian Caribbean if you're looking for modern cities that still hold on to their history. There you'll also find plenty of diving and hiking opportunities. To the east there are endless plains that have tropical savannas, forests, and wetlands. This is, perhaps, one of the least visited regions in the country. Along the Pacific Coast you'll find tropical forests, interesting marine life, and some of the country's best party cities. Head to the Colombian Islands if you're looking for a tropical setting with great diving. As far as climate goes, there really is something for everybody. Along the coast the climate is quite tropical. This is also true in the eastern plains and the Amazon. In the highlands the temperature is much colder and there are dry periods without much rain. Although winter is often referred to as the rainy season, this doesn't hold true in all parts of the country. It's best to pack clothes for all temperatures and climates. Colombia still suffers from its reputation as a dangerous and violent country but the reality is that the situation has much improved since the 1980s and 1990s. There are still some regions that are best avoided, but much of the country is welcoming to visitors and offers a unique travel opportunity. Eco-tourism continues to gain popularity throughout Colombia. You can usually find any number of trekking excursions on weekends. You can work with one of the many groups, known as caminantes, to participate in a cheap, one day excursion. There are also longer trips available on weekends and holidays. Some of the more popular groups that are based in Bogota include Viajar y Vivir, Fundacion Sal Si Puedes, and Caminantes del Retorno. If you want to buy some local handicrafts then a great option is the intricately designed jewelery that is available in the many markets or from street vendors. Quality can vary dramatically and bartering is a must. Look closely at the item you want to buy, consider its authenticity and craftmenship and then make an offer. Buses are a popular and relatively easy way to travel around the country. You can usually buy tickets the day of from the terminal and catch the next bus in route. Some companies will not sell tickets in advance, so familiarize yourself with the schedule so you can catch a convenient bus on your day of travel. Long distance travel can be slow so if time is crucial and money is not, a plane flight may be your better option. Colombia is growing fast as a hub for studying Spanish abroad. Colombian Spanish is generally considered "pure" with a clear accent. There are several good language schools you can choose from and some universities offer classes as well. Salsa classes are a great activity during your time in Colombia. The music is played everywhere and the country is famous for producing several world class dancers. In particular, Cali and Cartagena offer many different salsa clubs and schools. Los Nevados National Park: This national park is home to several snow covered volcanic peaks. These include Nevado Del Ruiz, Nevado del Tolima, and others. The park is managed by the travel agency Aviatur which gives it a more commerical feel, although there are still great trekking opportunities available. Catedral de Sal (Salt Cathedral): This large church was built in an underground salt mine almost completely out of salt. The walkways are lined with sculptures and there is an impressive cross over the alter. It is located in Zipaquira, which is a city about an hour north of Bogota. Tayrona National Park: This popular national park is situated along the Caribbean coast near Santa Marta. It's a beautiful coastline with stunning beaches. There is also a nearby native village which you can explore with a guide. Colombian food shares many dishes with its nearby neighbors, although each dish has its own unique twist. Although the names may sound familiar, be prepared for slightly different flavors and preparation techniques. Bandeja paisa: This popular meal typically includes rice, beans, fried plantain, arepa, fried egg, chorizo, and chicharron (which is pork crackling). Although it tends to be very fatty, it is also quite good and filling. Sancocho de Gallina: This lunch dish is usually served on Sundays. It's a chicken soup that includes chicken, rice and vegetables. It's found throughout the country although most regions have their own variety. On the coast it's not uncommon to find it made with fish instead of chicken. Empanadas: Colombian empanadas are very different from the Mexican variety. They are made with a pouch-like yellow exterior that is stuffed with meat and potato and make for an excellent snack, particularly during long trips.